LaN was saddened to hear of two climbers from the Boulder Colorado community that were reported missing during an attempt to summit one of the 20,000+ peaks in the Peruvian Andes this past weekend as LaN continued planning our September Peru trekking plans. Each of the points represents a clue in the imagery that people have spotted. Amazingly, lower on the mountain we see the trail begin to appear as people contribute tags along it. 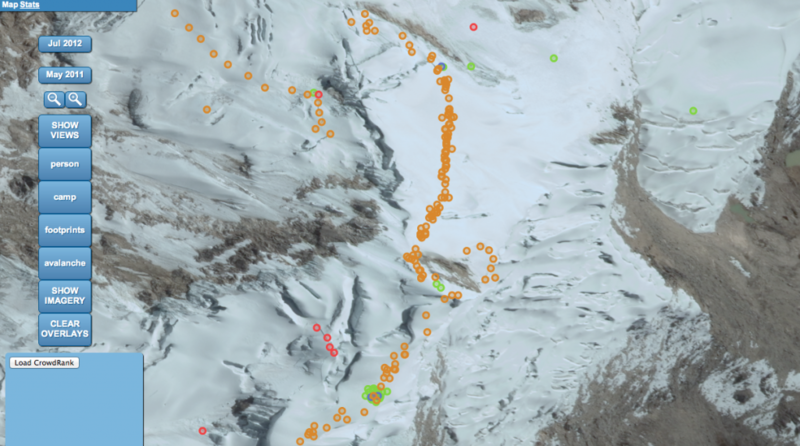 I was so pleased to find a site utilizing online crowd-sourcing (from one’s comforts of their living room no less) as means to track missing alpinists in frozen terrains via searching (very recent) satellite imagery … providing digital aid to extremely physical search efforts. Seemingly a new website, it perhaps was the first time it was utilized for such a life/death alpine rescue effort. 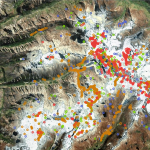 As such, an interesting live stream of questions and answers followed beneath one’s maps… as a network of online people and perhaps those with no alpine experience volunteered their eyes to pattern recognize footprint tracks, base-camp, recent avalanches and even people. Within my first hour of participating an update was posted in which an online viewer recognized what appeared to be 3 people (rescuers) moving across a glacier 10 meters apart (as would be expected). Aggregate views (seeing what others were tagging) was a feature at the time only accessible to the back-end tomnod crew… so it left me wondering what this large picture of tags was beginning to look like. 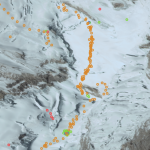 Recent avalanches are clearly more easily recognizable than people (people shadows) or tracks… so even I was feeling quite cautious to unknowingly tag the very much harder to detect footprints and people. 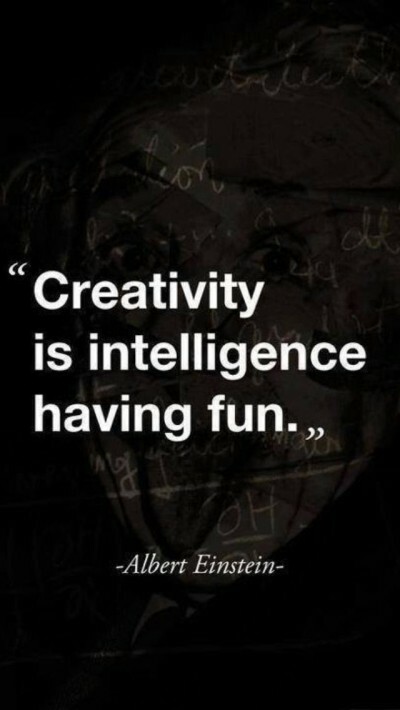 I kept thinking though… just go with your first vision, don’t over-think it and be willing to rely of the greater data set to reduce errors and pinpoint leads. The next morning I awoke to find the views of the combined tags from 795 contributors and … collective intelligence at it’s best… strongly highlighting an ascending path. The next morning’s news also shared the unfortunate update of the 2 climbers bodies having been located. While their lives were taken in the process… I read they did in fact reach the summit. 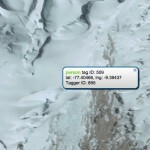 It is presumed the cause of death was a fall on their descent not far from the summit. To the climbers of this tragedy… you not only put footprints on the summit… I’m so sure your story will continue to forward this technology for the next in need.